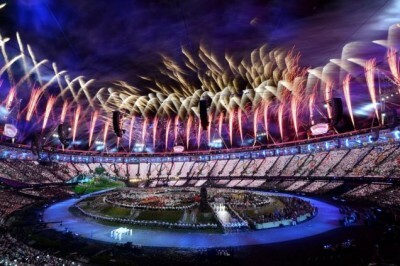 The Olympics in London have come to a close. The closing ceremony was held. Many fireworks, electronic special effects and celebrities were on hand to help celebrate the achievements made. A tribute was held for British Beatle's rocker, John Lennon who was killed in NYC. His existentialist depressing anti-religion song "Imagine" was sung and a large puzzle sculpture of his face was assembled by dancers. The "Spice girls" and George Michaels among others also gave short on musical performances. 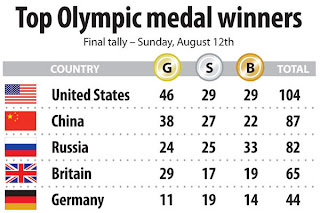 The United States of America came out on top with the most medals in each color and in total. 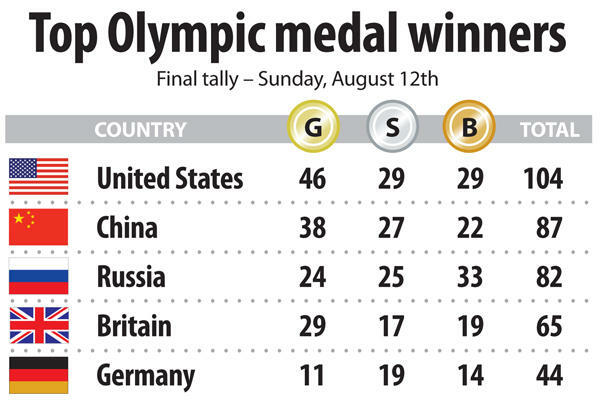 Congratulations to the American athletes and all the athletes from all over who won and didn't win. The Olympics are fun to watch and show what humanity can do. We can fight and compete without killing each other or take over each other. Wars or disputes among nations should be settled like this instead of in combat with arms. My major complains about this year's Olympics are the broadcasting replays from NBC and the John Lennon tribute. The song "Imagine" is very offensive and wrongly implies that religion is the cause of discord among humanity. Also, Eric Idle's comedy thing had these women dressed like nuns lifting their "skirts" in a provocative manner. Any historian or sociologist can inform you that religion is not the cause of war or violence. Politics and power struggles is what causes them. The World Wars, Wars in Vietnam, Japan, Middle East were not about religion. The Civil War, American Revolution, etc etc were not about religion. John Lennon was extremely inaccurate with his song which was written to appease the "hippie" sentiments at the time. Totally agree. Horrible, miserable, fatuous song.